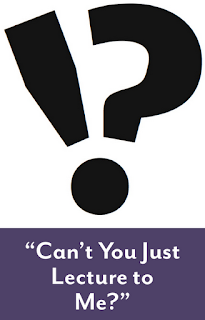 Teaching Without Walls: Life Beyond the Lecture: Archive: "Can't You Just Lecture to Me?" Archive: "Can't You Just Lecture to Me?" Last week, I was a featured keynote presenter for the inaugural Learning 2.0 Conference. It was a great experience. My favorite part was just the excitement and magical sensation of knowing I was sitting here in my home office presenting to a group of educators who were tuning in from around the world. It was a truly global audience -- so very cool. If you missed my presentation, here is the title, description, and link to the archive which will launch Blackboard Collaborate. Enjoy! And check out the recordings of the other keynotes here. Have you heard that line before? Teaching with emerging technologies requires not only a new technical toolkit but also a new set of skills for transforming reluctant students from passive into participatory learners. In this presentation, I will share stories and strategies from my own classes, showcased in my new book Best Practices for Teaching with Emerging Technologies, to assist college instructors with supporting students who are reluctant to embrace new forms of learning, use social media for learning activities, and play an active role in a learning community. Links to handy PDF guides will be shared to assist you with building a foundation for student success in your Learning 2.0 classroom.